This particular grill is one of two halves. The same element fits on both the left and right side. The compatible grill half element offered by Ransom Spares is an ideal solution if your grill is no longer heating up. This half grill easily fits with the existing half and provides the same amount of heating to ensure you always get uniform grilling. It is compatible with select models of Belling, Cannon, Creda, Hotpoint, Indesit and Jackson ovens. 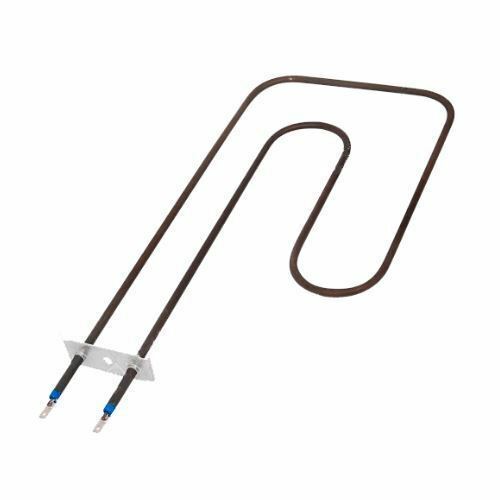 Genuine Grill element (Half) for Creda, Hotpoint, Indesit and Cannon cookers. This part fits either the left or right side - both are identical. Excellent Value part, fitted perfectly first time. Fast delivery as always from Ransom's. Highly Recommended. Arrived quickly and was very easy to fit. It is now working a treat! I am very pleased with the part excellent quality good price very fast delivery would use this firm again thank you. After reading and watching the reviews and video of how to replace, I found replacing the element really straight forward, especially from the front. I couldn’t believe how easy it is to remove the grill door! Good tip about using 2 pegs to hold the wires from going back through. Initial mistake in Order quickly dealt with by customer service. Compatible grill Elements easily fitted, can recommend your service to my friends. Very easy to fit, correct size for replacement, fitted from the front of cooker, no need to remove back. When you remove the cables from the element put a peg or clip on the cable as it could disappear in to the back of the cooker. Good replacement part.